Denis was born 1974 in Arkhangelsk, Russia. 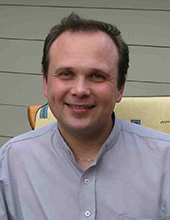 He received the Ph.D. degree in radiophysics from MSPU, Russia, in 2003. From 2000 to 2003 he was a pre-doctoral fellow in the Submillimeter Receiver Lab at the Smithsonian Astrophysical Observatory. Since 2003 he has been with the Group of Advanced Receiver Development in Chalmers University of Technology. Main research activities have been focused on radioastronomy nstrumentation. His current research interests include superconducting low noise heterodyne receivers for terahertz applications and the design of microwave and submillimeter wave components. There might be more projects where Denis Meledin participates, but you have to be logged in as a Chalmers employee to see them.